WASHINGTON — Saturday’s freight train derailment in Alexandria, Virginia, had investigators spending some 30 hours looking into the cause of the incident, but the morning commute is set to resume as normal on Monday. As the cleanup continues, Virginia Railway Express told WTOP it will operate full, regular service Monday morning on both Fredericksburg and Manassas lines. WTOP also reached out to Amtrak on Sunday and the railroad corporation said trains should be running normally Monday as well. “Everything is running on scheduled operations today – no delays or cancellations. The only exception is, (Sunday night), Train 66 will originate from Washington and not Newport News,” said Jason Abrams, Amtrak spokesman on Sunday. A CSX freight train derailed after approaching a railway bridge that partially collapsed Saturday morning. Officials said the scene took more than a day to investigate and the collapse affected passenger trains as well. 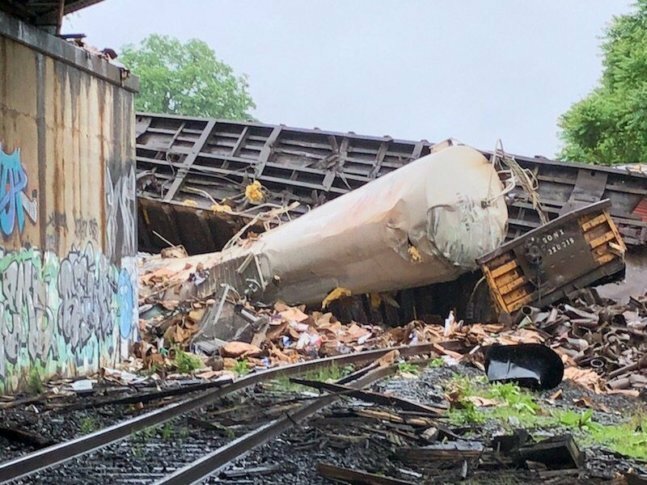 “Overnight and throughout the day today, crews were given approval to move the locomotives from the train, re-rail the cars without damage, remove the derailed railcars with damage and begin cleaning up debris,” a CSX spokeswoman told WTOP Sunday afternoon. “Freight and passenger train service has resumed at slower speeds on two of the three tracks, where there were no structural impacts or damage from the derailment. The derailment remains under investigation by the National Transportation Safety Board (NTSB),” the spokeswoman said. VRE said the crash affected Norfolk Southern tracks and that it would continue to coordinate with CSX and Norfolk Southern to assess any possible service impacts for either line. Thirty-one rail cars from the 167-car freight train derailed Saturday around 7 a.m. near the 4300 block of Wheeler Avenue after the train went into emergency braking, said Robert Sumwalt, chairman of the National Transportation Safety Board at a Saturday evening news conference. No injuries were reported and no hazardous material appeared to be on board, said city and transportation officials. Crew members said they reported “a soft or spongy condition” about 300 feet before the bridge and had no issues with the track or the train up to the point of derailment, Sumwalt said, emphasizing that the point of derailment was prior to the bridge. Gravel that holds the track structure in place was missing from the area where the derailment happened, according to Sumwalt. He said part of the investigation will focus on why ballast was missing from under the track near the derailment point. As the train cars derailed, some rolled over and struck the edges of the bridge, “taking out” part of the bridge, said Sumwalt. The train was traveling at 30 mph during the time of derailment; authorized speed is 50 mph. NTSB said the investigation may take about 30 hours. Two tracks in the area were still functional after the derailment, said Sumwalt, but trains were moving at 10 mph Saturday due to investigators present at the scene. City officials said there was no direct impact on area roads from the derailment. The freight train originated from Cumberland, Maryland, and was headed to Rocky Mount, North Carolina. A map of the area can be seen below. WTOP’s Nahal Amouzadeh, John Domen and Patrick Roth contributed to this report.